Once you have completed the Sunset Mall Quest you will need to build area 2 of the mall and then you will be able to built the catwalk area (see my guide to the mall for more details) once built one of your teen or adult sims can start this hobby at the mall. After the time has passed come back and click the exclamation mark above your sims head to find one of the catwalk collectibles. Every time your sims strut their stuff on the catwalk their hobby skill level up percentage will increase, once you reach 100% you will level up, there are 6 levels. You need to reach level 6 to be able to unlock all of the catwalk collectibles, once unlocked you will be able to find them. Blue Steel Blue Iron, Contrapose and The Diva are now unlocked in the hobby collection. Time Limited Hobby Events– the catwalk model hobby appears in these events, to complete these you have to complete the catwalk model hobby a certain amount of times during the time limit to unlock all of the prizes, you can find a list of time limited hobby events here. If you want to complete these time limited hobby events then have one sim get to level six in this hobby before the next event starts so you only have to do the shortest option when the event begins! This hobby is horrendous. : ( It takes 10.5 hours to complete each action (unless I’m missing something). At least it levels up quickly. Thanks for all you hard work and documenting all your findings! I built the wumple zone store and it only has toddler outfits, which are adorable, but no baby stuff. Do those come later?. Thats a good point, it says there are baby clothes when you build the store but there aren’t any! Is there a limited time to this? Love your posts! No joke. Could you post what each store unlocks? Ex: a visual on the clothes that you unlock by stores? And when is your next house contest? Is it easier to find the collectibles in this hobby (not getting same collectible too often) because it taken 10 hours? Or it’s just another mad-making hobby? I don’t know whether it is easier, I did find a few of the same ones but not lots, I would say it is might easier than all the timed hobbies! Hey, thank you for your blog, it’s sooooo helpful! I have cleaned the area 4 at the mall and I have built all the shops, but when I try to start building the area 5 it says that I haven’t cleaned the area 4. I have searched it many times trying to find out what else I have to do, but I can’t find anything, everything seems fixed and clean. Any ideas of what am I not noticing? How do i get a preteen that lives alone get adopted? Does it help one level up for other Sims to watch the fashion show? I think cheers helped with Salsa, but watching takes a lot longer. Thank you so much for everything on this blog! I have a glitch…completed line 3 in the catwalk hobby and I was not awarded the four stores. Any advise? Thank you for your blog! can anyone answer this for me? On the catwalk, my teen sim wears this light pink dress with white polka dots. I love that so much. Are those clothes unlocked in any of the stores? How to get silver life orb? But yes like every hobby the aim is to keep them doing the hobby until they complete it, you aren’t doing anything wrong, you just need to keep going. My sim is wearing this adorable red dress when modeling, can I buy it for her? Can male sims model? I’m doing this hobby and I saw on the mall page that the stores are SO expensive, so what stores should I get? Probably out of the early ones you get. Right now I have no teens or seniors. I’m getting preteens soon, though! Like tomorrow because I’m almost done with the quest. Thanks! I wanted to ask you about a pop up I just got in the sims freeplay. It says to begin the royal lineage quest to begin your journey forwards the Thorne. It must be for the royalty update. Do you think it will actually come with fairies like in the trailer? Yes they have just changed that in the update that came out today. Good! I thought I was going mad! To speed this up, can I have a second Sim walking the catwalk in a neighboring town? After you have a sim strut her stuff, it says complete 12 cat walks poses, what does that mean and what do you do?? Omg, thanks so much for your response! I’ve finished the ENTIRE catwalk hobby. I’ve cleaned up every inch of the mall possible….trust me I’ve spent a lot of $ on this game & I know I’ve cleaned every single inch possible. I’m on my 3rd pajama collection so clearly I’ve finished that hobby. There has to be a glitch. I am trying to unlock the bowling alley and it says i have construction requirement of “catwalk hobby grand prize won” what is the grand prize and how do i do it? you need to complete the catwalk hobby for the first time to unlock the bowling alley. 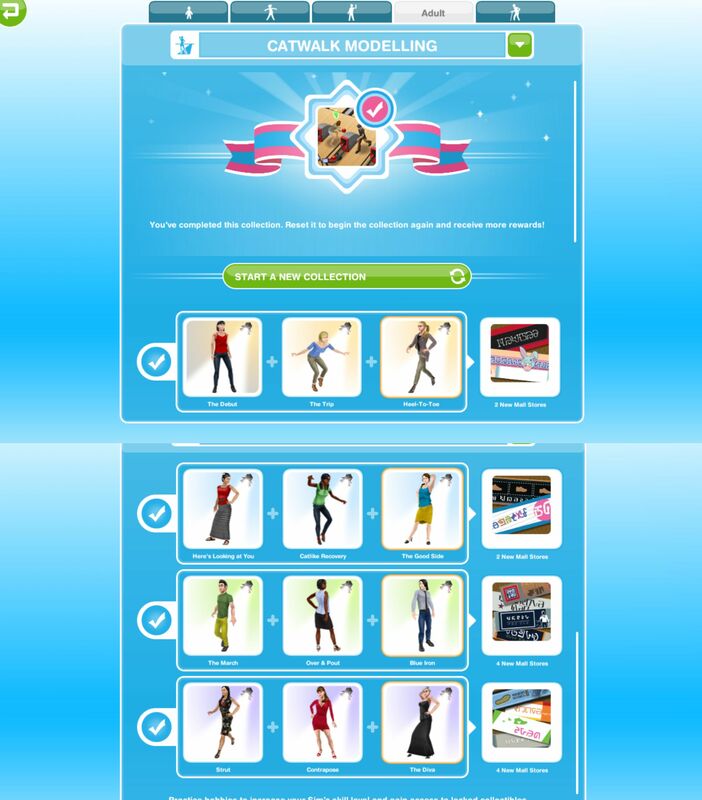 I’ve already completed the hobby and recieved all poses and everything but it still says “catwalk hobby- grand prize won” as the requirement for the bowling alley. I complete the catwalk hobby once. The bowling alley is still locked. What does that mean? I have completed the catwalk hobby 5 times and the bowling alley still isnt unlocked? I built a store but I can’t find the clothes anywhere?? Oh my gosh, you have saved me soooooo many times wait hold on lemme count 1,2,3,4,20,60,40000000 times, yep sounds about right! I finished the Sunset Mall quest and cleaned up the front area and catwalk area. When I click on the Casual Clothing store lock, it says I have to do the Catwalk Hobby 1st line of poses. I can’t do that until I open the store. What am I missing? Thanks for your help. You are AWESOME! Do the prices for the stores vary or is that their regular prices? This has happened for many people including me, I spoke to EA about it and they are aware of the problem so hopefully it will be fixed one day so the next time this event is available we can actually complete it! I have a question about availability of clothes in the wardrobe. A couple of my Sims Free play neighbors have mentioned that they don’t have pajamas or don’t have any available in the wardrobe. Have you ever gotten this question before? Yes, that’s right. Been a really long time since I’d completed that and I hadn’t remembered.